Results. All brewed teas contained lead with 73% of teas brewed for 3 minutes and 83% brewed for 15 minutes having lead levels considered unsafe for consumption during pregnancy and lactation. Aluminum levels were above recommended guidelines in 20% of brewed teas. 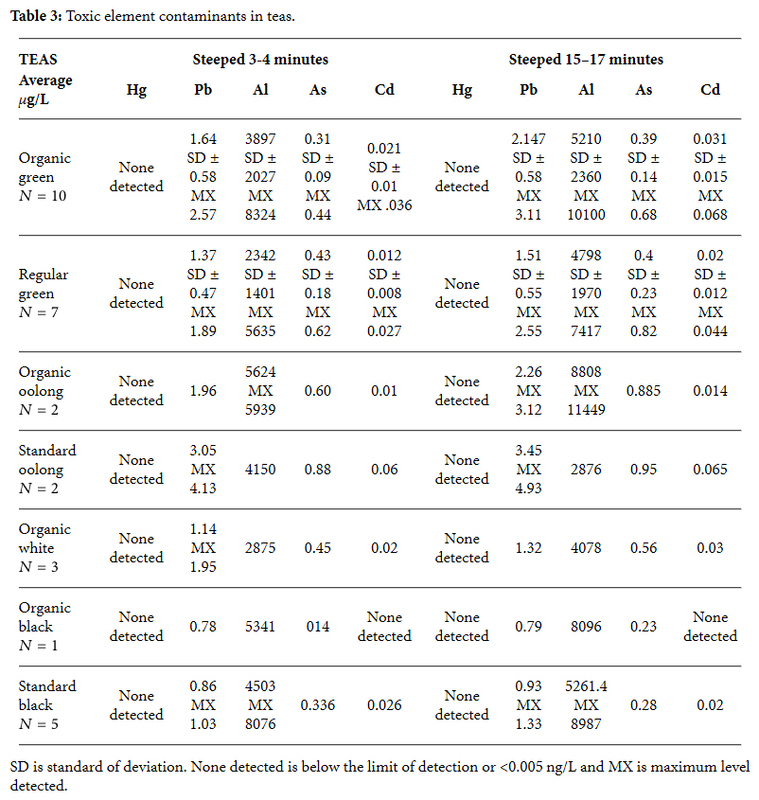 No mercury was found at detectable levels in any brewed tea samples. Teas contained several beneficial elements such as magnesium, calcium, potassium, and phosphorus. 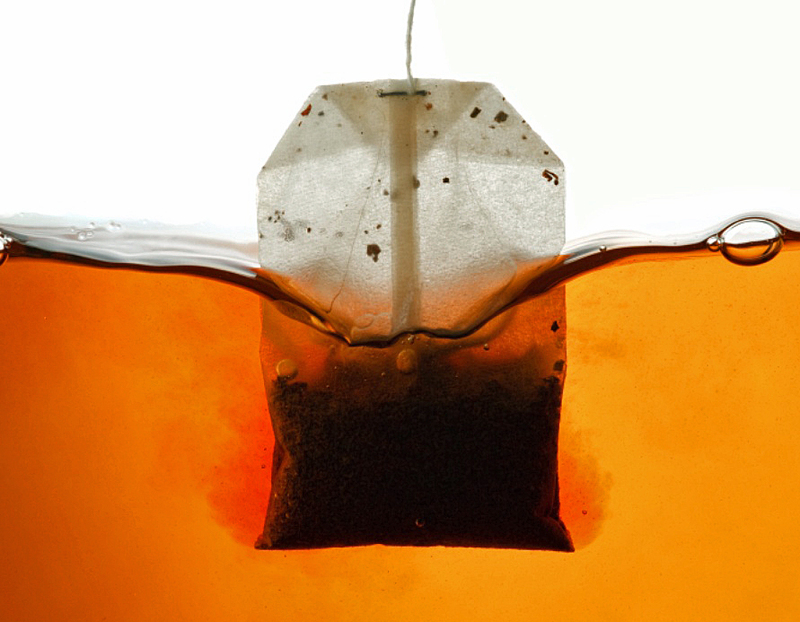 Of trace minerals, only manganese levels were found to be excessive in some black teas. Conclusions. Toxic contamination by heavy metals was found in most of the teas sampled. Some tea samples are considered unsafe. There are no existing guidelines for routine testing or reporting of toxicant levels in “naturally” occurring products. Public health warnings or industry regulation might be indicated to protect consumer safety. Heavy metals are in tea because heavy metals are in soil. Why? Soil and air contaminants may be directly related to the use of coal fired power plants. The use of coal in China has increased to 3.8 billion tons or about 47% of global coal consumption. Coal burning power plants supply 70% of the energy in China. I like this point they made about body burden. They gave the example of lead, but it applies to lots of pollutants, especially the POPs (persistent organic pollutants) which are fat soluble, bioaccumulate, and exist in high amounts in the fat of animals we eat. POPs are responsible for metabolic diseases like diabetes and obesity. This is why I say it’s impossible to eat Paleo; people thousands of years ago weren’t spraying pesticides on their food. It is insufficient to simply look at isolated exposures to toxic elements, but rather to look at the total cumulative exposure. As such, if individuals are being exposed to lead, for example, from drinking polluted tea as in this study, from taking tainted supplements , from consuming contaminated drinking water from lead pipes , from eating or drinking from dinnerware containing lead , and so on, the total daily exposure may be enormous. This entry was posted in Uncategorized on September 7, 2014 by Bix.